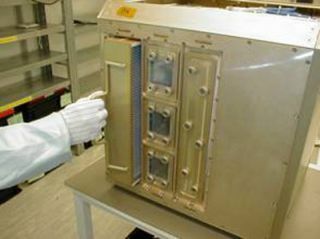 The lateral side view of the Mice Drawer System, a so-called "hotel" for six mice as part of a bone loss study aboard the International Space Station in 2009. The mice launched on Aug. 28 on shuttle Discovery and will return in November. Here, the mouse enclosure's waste filter is shown partially removed. A team of sixintrepid mice is going where no rodents have gone before: The InternationalSpace Station. The smallrodents are part of an Italian study investigating the effects of boneloss in space, and researchers have set the mice up in orbital style. ?Basically,it?s a little hotel,? said Joe Delai, Discovery?s payload manager, of the cagesholding the space mice. ?They have a room and a place to eat and sleep.? That creaturecomfort is key, he said. After all, the little mice will be living in space forat least three months before hitching a ride back home. Mice haveflown in space countless times before, even on space shuttles headed for theInternational Space Station. But the critters always stayed aboard thoseshuttles and returned home, said NASA?s space station program scientist JulieRobinson. The longest any mouse has lived in space has been about 30 days, andthat was while flying on an unmanned satellite, she added. ?This is a brandnew technology for carrying rodents into space,? Robinson said of the mouse enclosure. ?This will be, by far, the longest period of time that mice have been maintainedin the space station environment in an experimental setting.? The miceare living in a special experiment drawer deliveredto the station late Sunday by astronauts aboard NASA?s space shuttle Discovery.The drawer is split into partitions to give each mouse ample living room. ?Each mouseis in its own little compartment,? Robinson told SPACE.com. ?The compartmentshave screens around them so the mice can hold on with their feet so that they?rein control of their environment?so they?re not stressed out.? The miceget food and water through automated systems, which astronauts can refill whenneeded. A different system turns on lights to simulate day and night, andcameras will monitor their progress, Robinson said. ?We takegood care of them,? she added. AstronautNicole Stott, who arrived at the station aboard Discovery and joined the outpost?screw early Monday morning, checked in on the mice shortly after the shuttledocked. She apparently found them in good health. ?All isnominal,? Stott radioed Mission Control in her status check. The drawer will bestored in a refrigerator-sized rack inside the station?s Japanese Kibolaboratory with astronauts checking in on them every now and then, Robinsonsaid. The micewill return to Earth in November, along with Stott, aboard a different spaceshuttle. They were launched to the spacestation for the Italian Space Agency, which is overseeing the bone-lossstudy. Three ofthe six space mice have a special gene that combats osteoporosis, a condition thatleads to bone loss over time resulting in weak, brittle bones. A similar groupof six mice is being studied on Earth as a control group. On Earth, osteoporosisaffects women more than men, particularly after menopause, NASA has said. Butin space, astronauts routinely lose bone and muscle mass because of theirprolonged exposure to microgravity. Researchers hope the experiment may lead tobetter treatment for osteoporosis on Earth and protection for astronauts onlong space missions. If the micewith the special gene suffer less bone loss than those without when comparedto the control group, it ?gives you reason to go down a whole new set ofpathways to tackle osteoporosis on Earth,? Robinson said. The experiment could potentiallylead to more closely tailored therapies for osteoporosis based on an individual?sspecific needs, she added. The bone-loss study is only one of 21 experiments that will be performed using the space-station mice. Thirteen of those studies are based in Italy, with the othereight spread across NASA and the space agencies of Japan, Canada, Germany, as well as the member countries of the European Space Agency. ?All thedifferent physiological systems are being studied,? Robinson said. Discovery?sseven-astronaut crew is in the middle of a 13-day mission to deliver newscience gear and supplies to the space station. They will attach a massive cargo pod packed with 8 tons of new supplies to the station on Monday. Three spacewalks are planned to upgradeand maintain the orbiting laboratory. Theastronauts are also delivering a new treadmill named after comedianStephen Colbert. The mouse drawer compartments, however, do not haverecreational treadmills for their rodent tenants, Robinson said. SPACE.comis providing complete coverage of Discovery's STS-128 mission to theInternational Space Station with Managing Editor Tariq Malik in New York. Click here for shuttle missionupdates and a link to NASA TV.